Allas, who is from Palawan in the Philippines, says the firing was akin to a death sentence. Just weeks before, Allas had been diagnosed with aggressive Stage 3 cancer and needed immediate, life-saving treatment. The termination of her contract would end Allas’ employment visa, meaning she would no longer be able to access heavily subsidized public healthcare. Without that, Allas estimates that her treatment in Hong Kong — which includes three months of chemotherapy and radiotherapy to shrink her tumor, then an operation — will now cost at least 1 million Hong Kong dollars ($127,400). There are 385,000 foreign domestic workers in Hong Kong. They contribute 3.6% to the local GDP, based on personal expenditure, the cost of tasks they carry out at local rates, and the value of freed-up time for mothers, according to a report published this week from the charity Enrich. Many domestic workers allow residents to stay in employment by caring for young children and elderly family members. Yet Manuela Basto, of Hong Kong-based NGO HELP for Domestic Workers, says domestic workers being fired if they become too sick to work is not unusual. While it’s illegal to fire a domestic worker while they are on sick leave, it can be difficult for a foreigner to take legal action because without a visa they have two weeks to leave Hong Kong. 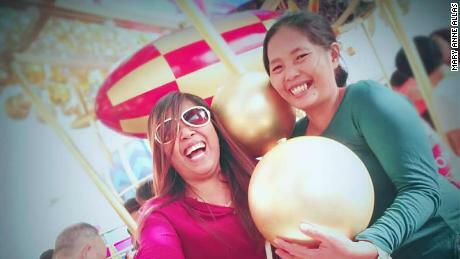 A mother of five, Allas arrived in Hong Kong in 2017 to earn money to support her family. “I was so excited to come here and see lots of tall buildings and nice places,” she says. Allas earned 4,520 Hong Kong dollars ($576) a month, the minimum wage for a domestic worker — and far less than the average monthly Hong Kong salary of 16,800 Hong Kong dollars ($2,038). 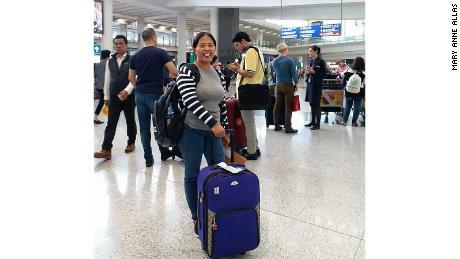 But back home, she says, it costs 16,000 Philippines pesos ($306) — just over 50% of her wages — to feed, clothe, house and educate her children. The rest of the money she was saving to buy a house. The working and living conditions she met in Hong Kong, however, were tough — and she says they often didn’t meet the standard set by the government. Allas’ contract, which CNN has seen, stipulated that she would be provided with a bedroom and bed in her employer’s three bedroom-duplex shared by six people in Yuen Long, a suburb of Hong Kong on the border with mainland China. In reality, she says she was made to sleep in a storage cupboard on a blanket. 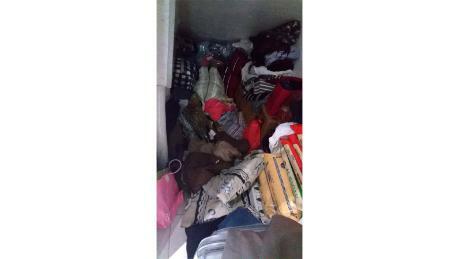 “At night time I had to take out all the things, the packs of rice, to make a bed,” she says. There are no maximum working hours for domestic workers, although they must legally receive one continuous period of 24 hours of rest a week. Allas says her working day began when she woke at 6.30 a.m. and continued until 10.30 p.m. when she was expected to walk the dog. Her rest day was often interrupted by requests for cleaning and dog walking. Furthermore, Allas’ contract indicated that her employers would provide food rather than a food allowance, but she says she was only allowed leftovers, or food passed its best by date. CNN’s phone calls and text messages to Allas’ employer went unanswered. Allas realized she was ill last December when she started to bleed heavily, despite having seemingly gone through the menopause three years earlier. 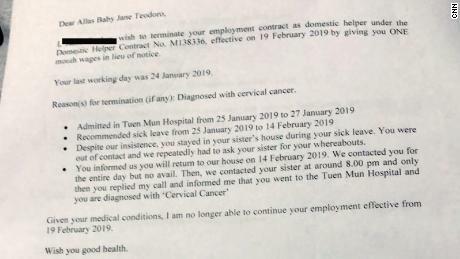 On January 20, Allas went to the doctor and was immediately diagnosed with aggressive cervical cancer and was subsequently signed off on sick leave until February 18 (longer than her termination letter noted, due to further hospital appointments). On February 17, Allas’ employers terminated her contract while she was on sick leave. Distraught, Allas says she begged her employer not to cancel her visa, but her pleas fell on deaf ears. Allas was fortunate, however, in one way: She had a sister, Mary Ann, also working as a domestic worker in Hong Kong. Mary Ann’s employer, Jessica Cutrera, offered Allas a place to live, and took on her legal and medical cases. Through her pro bono lawyer, Allas has now filed a complaint with the Labor Department, alleging that her employers violated the Employment Ordinance, which makes it illegal to dismiss an employee who is on paid sick leave. She has reported her employers for violating her contract by not honoring her day off and failing to provide a bed. A complaint has also been filed with the Equal Opportunities Commission, on the grounds that it is illegal to discriminate against someone who has a disability. “(For) a woman (like Allas) who whose written English isn’t proficient, has a phone but no computer, and doesn’t understand the laws,” she says, it would have been an incredibly confusing process to navigate. Allas’ visa has now been extended until March 20, while her case is pending. Cutrera has set up a charity funding page for Allas’ medical expenses. She has also explored the possibility of Allas returning to the Philippines for treatment, but has been informed she would likely have to join a waiting list at a hospital in Manila, miles from her home. “She will die without urgent treatment,” says Cutrera. Hong Kong is home to 385,000 foreign domestic workers, from countries including the Philippines, Malaysia and Indonesia, who generate $12.6 billion to the city’s economy each year, according to the Enrich report. Only 49% of Hong Kong mothers aged between 25 and 54 would be able to contribute to the workforce without the aid of domestic help, the report found. As it stands, 78% of that demographic is in the workforce. By enabling more mothers to work, foreign domestic workers are indirectly contributing $2.6 billion to Hong Kong’s economy, according to the report. More than that, Filipino and Indonesian domestic workers in Hong Kong, Singapore and Malaysia sent more than $2 billion in remittances in 2018 back to their home nations, illustrating that, in many ways, these women are also the backbone of their homelands. “Most domestic workers come to Hong Kong to earn higher salaries in order to support their family,” says Zamira Monteiro, communications officer at Enrich. Cutrera and Allas agree that Hong Kong is one of the best places in the world for foreign domestic workers in terms of labor laws and wages, compared to places in the Middle East, for example. But they acknowledge that when something goes wrong — such as a life-threatening illness — the system is not easy enough to navigate. “Imagine if Baby Jane didn’t have a sister in Hong Kong,” Cutrera says. Basto, of Hong Kong-based NGO HELP for Domestic Workers, would like to see the laws updated to allow medical providers in Hong Kong to be more flexible about treating women like Allas, and also to allow foreign domestic workers to live outside the homes of their employers. “These women are trusting their kids to us, but back home our parents are taking care of our children,” says Allas’ sister, Mary Ann. “If we don’t take care of their kids, they cannot work.